Whether installed at the time a new house is built, or as a later addition, a swimming pool should be incorporated into overall planning so that it becomes a vital part of the landscape. A landscape design professional will prepare a creative plan for the pool and the surrounding landscape. The design professional will prepare a creative plan for the pool and surrounding landscape. The design professional will also coordinate the various trades required to install and complete the project. Typically this will involve an excavator, pool contractor, mason, fence installer, landscape contractor, electrician, and plumber. When the construction phase is managed by a landscape design professional, the homeowner benefits by dealing with a single individual who schedules and coordinates the work and maintains cost and quality control. The design professional will prepare a creative plan for the pool and surrounding landscape. When the construction phase is managed by a landscape design professional, the homeowner benefits by dealing with a single individual who schedules and coordinates the work and maintains cost and quality control. Pools should be designed for function, appearance, and safety. When designing a swimming pool for your home, the best way to begin is to prepare a survey and analysis of the total property. Topography, mature trees, rock outcrops, views, sun and wind orientation all play a role in the overall design scheme. A landscape designer will analyze and interpret this information and will prepare an existing conditions plan. This drawing illustrates both the opportunities and constraints of the site, and provides clues on which a successful design is based. Siting a pool involves more than locating the most buildable spot in the yard. Lifestyle issues should be considered, such as a children’s use of the pool, exercies programs, outdoor entertaining, and night-time use. An “active” swimming pool is designed when children are involoved, or when the pool is used for regular exercise. A “passive” swimming pool is designed as a contemplative space for adults who desire a quiet sanctuary where they can relax on a warm day. A primary design consideration is whether the pool is to be a dominant or sub-dominant feature in the landscape. Determining the location and dominance a pool is to have involves considerations of house style, adjacent outdoor living spaces, services areas, play areas, and public entryways. When space is limited, a pool and its amenities may consume much of a small backyard, and thereby become the dominant feature. This pool will command attention and be the center of interest for outdoor activities and entertaining. it will most likely be in full view from interior rooms throughout the year. On a larger property, a pool is often located as a sub-dominant element, apart from the house. The pool then creates its own environment so that other landscape elements such as outdoor living and entertaining spaces, gardens, distant views, or a stand of trees can maintain thier prominance. 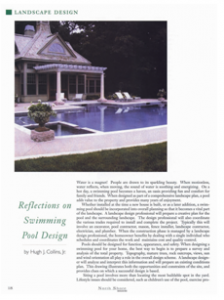 Because the swimming season in New England is relatviely breif, many homeowners prefer to locate the pool as a subdominant feature in the overall design. In this way the landscape remains the primary focus and provides beauty and interest in all seasons. Larger properties are generally designed as a series of outdoor “rooms”, with some areas commanding more interest than others. A successful design alternately reveals and conceals, creating a sense of mystery as one is drawn through the landscape. A swimming pool can be designed as an outdoor room of its own. Advanced landscape planning will also resolve related design issues such as space for lawn games, flower gardens, privacy, and fencing. Pool fencing, as required by state and local building codes, presents a challenge and may very well be the most difficult part of a swimming pool design project. Without consideration as to placement, height and style, fencing can appear intrusive and arbitrary. Careful placement of the fence, with conveniently located gates combined with appropriate plantings, will help to achieve an integrated appearance. Open black wrought-iron fencing, for example, can appear to be quite transparent and will allow the pool area to be visually connected with the surrounding landscape. Planting then becomes the medium which ties the pool area to the rest of the yard. Whether your property is large or small, whether your lifestyle is active or relaxed, a landscape design professional can ensure that a swimming pool will become an intergral and enjoyable part of your outdoor living space. This entry was posted in Articles by kate. Bookmark the permalink.